The obvious educational use of these dolls would be teaching young children the basics of counting; open one doll, open two dolls, open three, and so on, and so forth. In fact we have a series of dolls called counting dolls for just this purpose. Adding ½ + ½ + ½ can sometimes be hard for a young student to visualize, however crack open some nesting dolls, and use each half to help them count up to 1 ½. To help his students visualize 10! he would use a set of 10 nesting dolls, The largest doll would be assigned the number 10, the smallest would be assigned a 9, and then 8, and so on and so forth. The students immediately realized that 10! = 10x9x8x7x6x5x4x3x2x1, and used this visual concept to obtain a better grasp on advanced combinations and permutations. 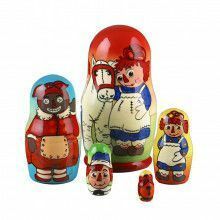 The symbol of the Nesting Dolls can effectively demonstrate theories of basic psychology. A fundamental goal of any psychology teacher is to get their students to have a firm grasp on one of the more important tenets of modern psychology: Freud’s concept of the Ego, Id, and Superego. We’ve spoken to a teacher who brought a three piece nesting doll to class. The largest doll had "Ego" written on it, and explained to the class that this doll represented their conscience mind, their five senses and perception, the part of the mind that interacts with the world. She then opened up that doll to reveal a smaller doll that said "Super Ego," she explained to the students that this nesting doll represented their moral, ethics, and other personal beliefs that lay slightly deeper in the subconscious. Finally she opened showed off the last doll that said "Id" she explained to the students that this nesting doll represented the deepest levels of the subconscious, and controls many of our basic survival instincts. She then put on a little mock fight between the two smallest nesting dolls to visualize how the Id, and the Superego fight for control of the Ego. Pretty clever, eh? 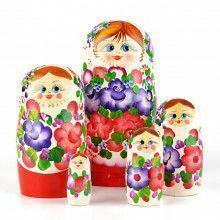 Check out a classic 3-piece nesting doll. Now we have a collection of chime dolls that you can ring, and have a musical theme to them, but if you’re interested in teaching someone music theory our traditional eight piece dolls are actually a great starting ground. 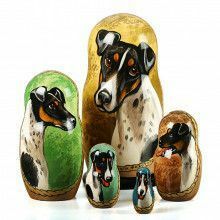 A music teacher had this to say about nesting dolls: "Thanks so much for your quick delivery of your 8 piece Red Roses Nesting Dolls. I teach music to children, and one of my students was having a really hard time remembering his scales, so I came up with a little activity. I wrote each of the 12 musical notes on a large piece of paper. 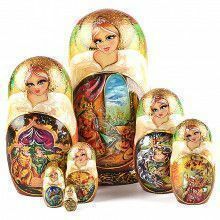 Then I wrote root position on the first doll and Whole Step Whole Step, Half Step, Whole Step, Whole Step, Whole Half on the remaining seven nesting dolls. I would then place the largest doll on one of the notes, and have the student place the remaining dolls on the proper notes. Based on the size of the dolls, and the word Whole Step or Half Step that I wrote, he was able to figure out which notes were on all of the major scales!"